Special attention was given by the writer to the study of the manufactures of these people, so few of which are known except for excavated remains. The canoe / Courage! / You have the power to succeed in reaching the other side, so that you may get where you want to go . . .
Sea captain Sebastian Vizcaino explored the southern California coast in A.D. 1602, sixty years after the first Spanish ships had ventured northward from Baja California. He sailed through the sun-drenched waters of the Santa Barbara Channel, which the Chumash called "The Ocean-Where-the-Islands-Are-in-Front." He wrote, "A canoe came out to us with two Indian fishermen, who had a great quantity of fish, rowing so swiftly that they seemed to fly . . . After they had gone five Indians came out in another canoe, so well constructed and built that since Noah's Ark a finer and lighter vessel with timbers better made has not been seen. Four men rowed, with an old man in the center singing . . . and the others responding to him." Thousands of Chumash lived on the shores of the Santa Barbara Channel. Vizcaino says in his journal that the Indians were "well formed and of good body, although not very corpulent." Modern estimates  place the sixteenth-century population at about fifteen thousand, many dwelling in large, permanent villages of well-made domeshaped homes. At least two thousand Chumash inhabited the offshore islands. By the 1870s, a mere handful of Chumash still survived. Scientists considered them museum specimens. H. C. Yarrow, government ethnographer, wrote, "In 1875, the year in which we write, not a soul can be found to give any information as to the ancient inhabitants of this part of the coast:" He and his colleagues spent their time collecting basketry and other surviving artifacts. Everyone assumed the Chumash  were effectively extinct, a dead people known only from anonymous artifacts and Spanish accounts. For more than half a century, both archeologists and historians looked at the Chumash through a narrow scientific microscope. Unbeknownst to them, an eccentric, somewhat paranoid anthropologist was working with still-living Chumash right under their noses. He identified with them so closely he became a Chumash himself. Thanks to this man John Peabody Harrington-and to inspired multidisciplinary research based in part on his field notes, the ancient Chumash have come alive again in a minor triumph of modern science. John Peabody Harrington, son of a Massachusetts attorney, moved to California with his family when he was a child. In 1902, Harrington entered Stanford University, where he majored in anthropology and classical languages. During a summer class at the University of California, Berkeley, he came under the influence of the great anthropologist Theodore Kroeber, then working on his encyclopedic study of California Indians. Almost immediately, Harrington became obsessed with native American languages and ethnography. Instead of completing a doctorate, Harrington became a language teacher at Santa Ana High School in southern California. For three years, he devoted all his spare time and summers to living with the Chumash and other southern California Indian groups. He would contact informants, live with them in their own homes, and squeeze them dry of information. Eventually, Harrington's work came to the notice of the Bureau of American Ethnology, the official body charged with gathering artifacts and information about Native Americans. Harrington became a permanent field ethnologist for the bureau in 1915, a post he was to hold for nearly forty years. Harrington lacked formal training in linguistics, for he came to the field from classical languages. But he had a genius for Native American tongues. When asked how many Indian languages he could speak, Harrington replied: "Oh that is difficult to answer, because so many are related. I suppose about forty:" He compensated for his lack of training by developing his own phonetic orthography, which enabled him to record almost extinct languages phonetically. Therein lies the great value of Harrington's work, for his system preserved the phonetic accuracy of now-vanished languages. His notes on the Chumash alone are priceless. Harrington recorded the phonetic spelling on slips of paper cut to a convenient size. He confessed to using "a searching . . . ethnological questionnaire . . . with the [Indian] informants, yielding very gratifying results. Detailed information on ancient dance regalia and the process of preparing native tobacco and its uses was obtained . . :" Everything became grist for Harrington's ethnographic mill: data on ground-squirrel traps, on canoes and weapons, on basket making and stone implements. He experimented with throwing sticks, ate Chumash foods, and participated in religious ceremonies. He collected an enormous body of undigested information on social organization and religious beliefs, on the Chumash worldview, and on astronomy. Of Harrington's true personality we know little, for he wrote sparingly about himself and was called a "mystery man" by his colleagues. He lived alone, surrounded by dusty papers and overflowing file cabinets, never telling anyone his whereabouts. Sometimes he moved from a house simply because people had found out where he lived. He never had a telephone, stayed out of touch with the bureau for months, surfacing only when he needed to cash his paychecks. Few colleagues ever learned what he was doing, for he avoided them on the grounds that controversy and discussion were a waste of time. Harrington never used his priceless field notes to prepare even a short monograph on the Chumash, although he published on many other anthropological topics. When Harrington died in lonely and reclusive poverty in 1961, no one had any idea of the extraordinary riches that lay in his yellowing papers. Then some archeologists came across some of his Chumash papers on loan to the Department of Linguistics at the University of California, Berkeley. Anthropologists Thomas Blackburn, Travis Hudson, and others combed through over two hundred cardboard boxes of notes, more than 100,000 pages in all, over a period of five years. John Peabody Harrington unwittingly achieved his ambition. Thanks to his intense questioning of Chumash now long dead, modern scientists can work with the mysterious Harrington at their side in the form of his voluminous jottings, sometimes with phonetic Indian voices in the background. Anthropologists even built a replica of an ancient Chumash canoe, using with his notes as a blueprint. In 1976, the Santa Barbara Museum of Natural History decided to remodel its Chumash Indian exhibit hall. As the curators wrestled with the design, the San Diego Museum of Man offered them a replica of a Chumash planked canoe, a tomol, built around 1912 for John Harrington by an aged Chumash master canoe builder. Anthropologist Travis Hudson of the Santa Barbara Museum searched for Harrington's notes on the project. He was astounded to find 500 pages of notes on the canoe buried in the Smithsonian Institution. True to form, Harrington's observations lay between ramblings on everything from the use of wagons, the airing of mattresses, and botanical cures for diarrhea. His notes came in English, German, Spanish, and sometimes other languages, to say nothing of Chumash. Hudson and his colleagues organized the notes into a narrative account of tomol building, trying to recapture the Indian account from Harrington's ramblings. Just as the manuscript was nearing completion,  another 2,500 pages of notes came to light in Berkeley. They showed Harrington had been working on the tomol question as late as 1957, 40 years later. But the real hero of the tomol story was Fernando Librado, a Ventureno Chumash, who built the 1912 replica and also served as Harrington's informant. Philosopher, storyteller, and keen observer, Librado recalled important construction details about making the tomol that had been forgotten for 60 to 80 years. A guild member of the elite Brotherhood-of-the-Canoe, he had become a master canoe builder in the 1850s. Fortunately, Librado lived to the ripe old age of seventy-five, dying in 1915. Travis Hudson decided he would submit Fernando Librado to the test by using his instructions to build an exact replica of a tomol. Local boatbuilders Peter Howorth and Harry Davis and members of the Quabajai Chumash Indian Association of Santa Barbara spent three weeks building the 26 1/2-foot (8 m) Helek from driftwood collected on the beach. A Chumash crew took the tomol to sea, first paddling it close inshore. Then, on a memorable expedition, they voyaged along the ancient island trade routes. They returned with a profound respect for the seafaring abilities of their ancestors. "The board canoe was the house of the sea," Librado tells us. Only master canoe makers built the tomol, working with small groups of helpers. They took their time, sometimes between two and six months to construct a single canoe. tomols had to be large enough to carry between three and six men and a heavy load. Most were between 12 and 30 feet (3.7-9 m) long, with a beam of about 3 feet (0.9 m). At the same time, the vessel had to be light enough for her crew to carry. First, using whalebone wedges, the canoe builders split seasoned driftwood into planks. Then they shaped and thinned each plank with bone, shell, and stone tools, eliminating knots and cracks where possible. Once adzed to a uniform thickness, the planks were smoothed with sandpaper made from dried sharkskin. A long, heavy plank with a dished upper surface formed the bottom of the canoe. A supporting frame of forked timbers held the base so the canoe could be built right side up. Now came the difficult task of bending six or more planks around the bottom timber. The builders soaked them in a clay-lined pit filled with boiling water heated with fire-heated stones. After a few hours, the saturated planks were bent into shape and fastened in position. Each  plank rested against the edge of its neighbor, carefully beveled end-to-end to give greater strength. Next, two men sealed the seams with a mixture of heated bitumen and pitch called yop. They took care to align the boards correctly before the caulking cooled, a task that required skill, a good eye, and great speed. Finally, the men grooved each plank to its neighbor, and drilling pairs of holes, sewed the planks together with waxed twine made from red milkweed grass. Days passed as the builders fitted the remaining planks, each shaped and beveled according to the shape and size of the hull. Between the fifth and sixth planks, the builders installed the only structural cross member, a beam that braced the canoe amidships. The sixth plank formed the gunwales, which were left open at bow and stern, leaving V -shaped gaps for fishing lines or pulling ropes. Stout posts were installed inside the hull at bow and stern; "ears," crescentshaped washboards, were sewn to the gunwales at bow and stern to deflect water in rough seas and heavy surf. Now the men turned the canoe over for caulking. They hammered tine grass stalks into the outer seams, then sealed them with yop. Once the yop was dry, the men scraped the entire hull with an abalone shell, removing surplus caulking. When the master builder was satisfied, they coated the hull with a mixture of red ocher and pine pitch to seal the wood and prevent it becoming saturated and unduly heavy. Using raccoon tail brushes, they delineated the ties and joints with a black paint, decorated the canoe, usually with shell inlays on the ears and occasionally with powdered shell thrown against the wet finish before it dried. This made the tomol glitter in the sunlight as it approached land. "Once they have completed the tomol, they put it into the sea and row it about, seeing if there is anything wrong with it . . . They check for leaks and whether or not the canoe is lopsided or sinks too deeply into the water. . . ," according to Librado. They also ballasted the new canoe, for her light structure required considerable weight to make her stable in the water. Peter Howorth and Travis Hudson experimented with the Helek's seaworthiness. They loaded the canoe with five sandbags weighing a total of 325 pounds (147 kg). These soon absorbed water, adding to the overall weight. The canoe carried a crew of four men, their paddles and personal gear, for a total dry weight of 1,200 pounds (544 kg). Howorth and Hudson estimated the canoe could carry between 3,000  and 4,000 pounds (1360-1814 kg) when fully laden. Even when loaded, the Helek was stable and swift on the water, easily propelled by simple wooden paddles. Fishermen would work as far as 6 miles (9.6 km) offshore, Librado said, "without fear of the very high waves of the Pacific Sea, which, at times seem to lift them as far as the clouds and at other times to bury them in the bottom on the sea:" The Chumash went to sea in these remarkable craft to fish, to trade with people on the islands, or to carry passengers along the shore. The canoes leaked constantly and required almost daily caulking and repair. One of the crew would bail constantly with an abalone shell, for "the tomol is a patchwork canoe," Librado told Harrington. The Chumash launched their canoes from open beaches. They had great respect for rogue breakers and were prepared to wait patiently for a quiet interval. Then they would carry the tomol into the water until she was just afloat. While the captain held her bow into the waves, passengers and cargo would be positioned aboard. Then the crew scrambled in, while a fourth man held the canoe, then gave her a sharp push offshore as the paddlers worked to take her beyond the breaker line. Each paddler sat on his heels on a pad of sea grass, paddling with an even rhythm, using his shoulders to do the work. Soon the tomol would be ewe 'alhoyoy'o, moving swiftly through the water. A skilled crew could keep up a steady pace all day, paddling to a canoe song repeated over and over again. The Helek's crew found their speed depended on the wind direction. With an 8-knot following wind and swell, they could make 6 to 8 knots. But if the same 8-knotter blew from ahead, the tomol made no headway against wind and waves. Almost certainly the Chumash seafarers made their island journeys and fished offshore during calm weather and during the morning hours, when winds are calm. Under such conditions average passage speeds of 7 knots to and from the offshore islands were probably not uncommon. Fernando Librado told Harrington, "Canoe faring is dangerous, and drownings are frequent. There would be no coming home, for a wind or wave might capsize a tomol and a man could drown . . . Rather than make the crossing of The-Ocean-where-the-Islands-are-in-Front . . . the Indians hug the mainland shore.. :" Chumash seamen rarely made passages at night, but when they did they navigated by the stars. For weeks on end they would leave their canoes ashore, especially in September and October, when the celebrated Santa Ana winds blow  strongly from the northeast. But Chumash seafarers were vital to a society living on both islands and mainland. As members of the Brotherhood-of-the-Canoe, they served as sea traders, exchanging scarce raw materials from the mainland for manufactured goods from the islands. Everyone's survival depended on cooperation, on the exchange of foodstuffs and raw materials between widely separated communities, both in times of plenty and in drought years, when food was scarce. Most of the year, "The Ocean-Where-the-Islands-Are-in-Front" appears benign and predictable, forming a sheltered channel where moderate winds and air temperatures rarely fluctuate, rarely become too hot or too cold. Bright skies and clear days cycle for weeks on end. Natural coastal upwelling of cold water from the depths of the ocean replenishes the surface layers of the Pacific with nutrients. Chumash fishermen harvested plankton-feeding anchovies by the thousands as they moved inshore in summer. They also harvested the larger fish that fed on the anchovies. Not completely dependent on fish and sea mammals, the Chumash hunted mule deer, ate shellfish, and foraged for acorns and other plant foods. One Spanish missionary wrote, "It may be said for them, the entire day is one continuous meal:"
Even today, after generations of chronic overfishing, the Santa Barbara Channel teems with marine life. I have sailed from the mainland to the islands on a calm day, as hundreds of dolphins played around my bows. Seeing dolphins gamboling, it is easy to believe the Chumash lived in a paradise on earth, where food was always abundant, where no one starved. Close to the surface, great basking sharks enjoy the light and warmth; sea lions sunbathe in the bright sun. Sea birds soar overhead and dive, feeding off enormous shoals of school fish. Pods of whales migrate through the channel, often passing close inshore. Well-meaning local historians have turned the Chumash into noble savages, envisioning them living in a carefree land of plenty. But John Harrington's copious notes reveal a society that relied on an astonishing range of foodstuffs, a society ridden with factionalism and constant bickering between neighboring chiefs. Yet he recorded a culture with a rich ceremonial life and a sophisticated knowledge of astronomy but said little of the deep stresses endemic to Chumash society. We know from scientific examination of prehistoric Chumash skeletons, many of them excavated by nineteenth- and early-twentieth-century  archeologists, how Chumash groups and their predecessors lived in the Santa Barbara Channel region since at least 7000 B.C., perhaps even longer. At first, they relied heavily on wild seeds and shellfish, only rarely staying in one place year-round. As island and mainland population densities rose, the Chumash ate more and more fish. Sometime later, about 2,000 years ago, the tomol came into use, allowing people to fish farther offshore. Then settlements became more sedentary, and the Chumash developed an ever more complex society. Their trade networks extended inland as far as the Southwest. By A.D. 300, the Chumash were using sophisticated fishing equipment, virtually identical to the artifacts recorded by John Harrington. Since Spanish accounts told of a land of plenty, scientists at first assumed the sophistication of Chumash society resulted from plentiful food supplies. Modern science paints a very different portrait of their existence, of a seemingly benign environment that nonetheless was frighteningly unpredictable, with famine a constant threat. Instead of living a relaxed existence in paradise, the Chumash lived conservatively, well aware of the unpredictability of their environment. Canoes, fishing spears, nets, acorn-grinding technology, everything and everybody became geared to the efficient exploitation of seasonal foods. Some villages stored large acorn crops each fall. Others harvested thousands of anchovies, while a few miles away their neighbors hunted sea mammals. Each local community was vulnerable to unexpected food shortages. So the Chumash organized elaborate trade networks. These distributed foodstuffs and more exotic materials over large areas and between islands and mainland, reducing the risk of famine. At the same time, their social organization allowed for marriages between villagers living in different environments: Marriage arrangements promoted economic interdependence in periods of scarcity. Village chiefs organized elaborate ceremonies and feasts, gifts were exchanged, reinforcing these vital relationships and obligations. Ties of reciprocity became the political cement that held the entire Chumash economic system together in the face of environmental hazards and common enemies. Enjoying days of warm sunshine and moderate temperatures along the southern California coast, you wonder how such an environment could be so unpredictable, to the point where people would starve. Stress levels in Chumash society stemmed from periodic, and often serious, droughts, such as the one that affected California in the early  1980s. El Niño events cause current changes in the Pacific, affecting the stability of the coastal ecosystem. During El Niños, warmer equatorial waters reach the Santa Barbara Channel during the winter months, when nutrients are replenished. Marine productivity falls dramatically, and the fish, which feed on the nutrients, move away from the coast. At the same time, the El Niño brings violent storms that rip out inshore kelp beds, again destroying coastal fisheries. For example, the El Niño of 1982-84 destroyed 90 percent of local kelp beds, once a major source of Chumash livelihood. It is one thing to speculate about the effects of droughts and El Ninos, quite another to document their existence in the remote past. Fortunately, three avenues of scientific inquiry offer promising clues: tree rings, deep-sea cores, and human bones. Big cone spruce (Pseudotsuga macrocarpa) grow in the Transverse Ranges inland from the Santa Barbara Channel. Tree-ring samples from these trees give the dendrochronologists sequences of annual growth rings covering each six-month rainy season from A.D. 1366 to 1985. A wide ring signals a good rain year, a thin ring a drier one. Since wet and dry years tend to come in cycles, sequences of rings can be matched to one another with considerable accuracy. The 619-year sequence gives an accurate series of five-year rainfall averages. It shows no signs of long-term changes in annual rainfall. But there were constant rainfall fluctuations in the late sixteenth and early seventeenth centuries, with low rainfall in the late seventeenth and first half of the eighteenth century. The periods immediately before and during the Spanish mission period, which began in 1769, were ones of highly variable rainfall. Everything points to unpredictable climatic conditions. Big cone spruce trees south of Santa Barbara allow scientists to extend the climatic sequence back to A.D. 400. The spruce rings show terrestrial conditions were much more variable before the 619-year sequence. Between A.D. 500 and 1250, the Chumash homeland experienced extremely variable conditions, marked by several severe drought episodes. Since drought in a semiarid region means reduced terrestrial productivity, food shortages almost certainly occurred during these episodes. Climatic evidence from the floor of the Santa Barbara Channel confirms this great variability. Biologist Nicklas Pisias studied minute invertebrate fossils from layered deep-sea cores, plotting the changes in frequency over time. Such creatures are sensitive to changes in sea temperature to the point that their geographical distributions shift significantly as climatic conditions change and the ocean becomes  warmer or cooler. (Fish, also sensitive to sea-temperature changes, increase or diminish in supply. Witness the large numbers of tuna caught in southern California waters during El Niño episodes.) By comparing his changing invertebrates with modern distributions of the same forms, Pisias could document significant changes in water temperature, producing high-resolution estimates of past sea surface temperatures over long periods of time. Beginning at 6000 B.C., and using twenty-five-year intervals, he was able to document the high variability of surface ocean temperatures through centuries and millennia. Because sea temperatures, like rainfall, are important predictors of resource availability, Pisias' data can be used to predict variations in the productivity of the marine environment through time. When examined together with tree rings, these data help identify periods when warming sea temperatures coincided with drought on land, creating havoc with local hunter-gatherers. The centuries between A.D. 500 and 1250 were notable for sustained warm-water episodes and several major drought cycles. In contrast, both earlier and later times display less variation and more favorable conditions. Bioarcheologist Patricia Lambert was particularly interested in what happened to the health of Santa Barbara Channel populations during the harsh, unpredictable climatic conditions of A.D. 300 to 1150. She also focused on a number of other variables, especially the health costs associated with changes in local lifestyle, most notably the shift to more fishing and settlement in permanent villages. Human skeletons from several museum collections provided her with a unique opportunity to actually observe the health consequences of changes in the physical and social environment. Lambert studied skeletons from eight archeological sites on Santa Cruz and Santa Rosa, islands off the Santa Barbara coast. Her sample included several hundred individuals and covered over 7,000 years of prehistory, from 5000 B.C. right up to European contact in the sixteenth century. She began by searching collar and limb bones for bony plaques (periosteal lesions), which form on the outside of these bones when they are exposed to infection or injury. Sedentary villagers, like farmers or fisherfolk, have a much greater chance of contracting infectious diseases for several reasons. Sanitation is poor around their permanent dwellings, bringing people into contact with animal and soil pathogens. Accelerating trade contacts spread infectious diseases over long distances. Furthermore, people living on a few staple foods may suffer from malnutrition, which can make them more susceptible to infectious disease. An increase in inflammatory bone lesions has indeed been documented in prehistoric farming populations. But was this due to increased population densities and permanent settlements, or to nutritional deficiencies? The Chumash, with their protein-rich diet, offered an excellent chance to find out. Lambert knew periosteal lesions occur most commonly on the lower limbs, so she made counts of lesions on seven major bones, then she also carried out statistical analyses on lower-limb bones. The lowerlimb count served as a check on the figures from the seven bones. Allowing for the very incomplete nature of many of the skeletons, she compiled what she called an "index of severity" for each bone by dividing the maximum length of the lesions by the maximum length of the bone. At the same time, she recorded the degree of healing. Some bones displayed healed lesions, others active ones, still others chronic lesions. When Lambert plotted lesion frequencies against time, she found they increased significantly, especially during the climatically unstable period between 1500 B.C. and A.D. 1100, then declined somewhat in the centuries before European contact. The few small lesions in earlier times were probably due to trauma, whereas lesions became larger and more numerous in later centuries. Many more lesions were active or healing at the time of death in these later populations, which strongly suggests they were due to an increase in infectious diseases. What caused the increase? Lambert believes the people were exposed to a new disease or developed increasing susceptibility to an existing one. One possible culprit is endemic syphilis, a childhood disease still common in some undeveloped countries. For a long time, scholars denied syphilis occurred in the Americas before European contact, but a growing body of skeletal evidence, including four individuals from the Santa Barbara Channel region, bear the characteristic skull lesions associated with the disease. As health declined, so did the stature of both men and women. The total loss, measured by the length of the femur (the thigh bone), which  represents about 27 percent of a person's height, was as much as 4 inches (10 cm). One could argue such a change resulted from wholesale population movements, which brought new groups of shorter people into Chumash country, or from generations of close intermarriage, which can cause stature to decline. Lambert found no evidence for major population changes or for the kind of isolation that fosters inbreeding. Quite the contrary, trading contacts between mainland and islands, between coast and interior, increased over time. Archeologist John Johnson has used Catholic mission records kept by Europeans to document regular marriages between islanders and mainlanders, coastal dwellers and people living inland. Lambert believes the decline in stature was a regional phenomenon related to both periodic malnutrition and to increasing susceptibility, and exposure, to infection. Some years earlier, Lambert's colleague Phillip Walker had looked at the dental health of the early Chumash. He found a widespread occurrence of dental hypoplasia, bands of defective enamel that form when a child's growth is disrupted by malnutrition and disease stress. Hypoplasia is invaluable to biological anthropologists, for it provides a measure of a child's general state of health and of a group's susceptibility and exposure to disease. Like periosteal lesions, hypoplasia increased considerably through time, again most notably after 1500 B.C. Significantly, the highest frequencies occurred in large, densely populated mainland villages, where the advantages of dwelling in a sedentary settlement carried a high price: greater exposure to infectious diseases, and, probably, a decline in the nutritional quality of the diet. Malnutrition most likely occurred when the fisheries declined, or when the fall acorn harvests failed, making it difficult for a large population to feed itself. When Walker and Lambert examined prehistoric skulls from island and mainland sites, they noticed a great deal of variation in the amount of pitting in the eye socket roof, not only from place to place, but through time. This condition, Cribra orbitalia, develops in children as a response to iron deficiency anemia but remains visible in adult skulls. Walker found Cribra orbitalia occurred most commonly among the people of San Miguel Island, after A.D. 1150. San Miguel was the most isolated of all Chumash territories. Drinking water was scarce and plant foods in short supply. Significantly, Cribra was rare on the mainland and on Santa Cruz Island, the largest offshore landmass, with diverse animal and plant foods and more abundant water sources. Walker  believes children on San Miguel developed diarrheal disease more commonly because of contaminated water sources. When Lambert studied the variation in Cribra through time, she found the highest frequencies occurred in both island and mainland populations between A.D. 300 and 1150. As we know, this was a time of frequent droughts, when permanent surface water sources were scarce, even on the mainland. Drought forced large numbers of people to depend on a few permanent supplies. Many sources were probably polluted. Cribra orbitalia became more prevalent over the centuries, probably because of sanitation problems resulting from more crowded, permanent village populations and lack of proper septic systems in the villages. An increasing dependence on protein-rich fish did not protect the Chumash from the kind of health decline that occurs when hunter-gatherers settled down to farm. Crowding into larger settlements, living cheek-by-jowl with dozens of families, and encountering people and their diseases from many miles away cost coastal groups the good health they had known for thousands of years as mobile hunter-gatherers. Stress also brought warfare. Chumash groups fought with one another with increasing frequency over more than 5,000 years. We know this from evidence of wounds displayed by skeletons found in prehistoric cemeteries. Archeologists have long known some Chumash died from wounds, for they had found stone projectile points still dug into their bones. But bioarcheologist Lambert has looked more closely at the wounds themselves, poring over not only the bones but artifacts found with the skeletons, and excavation records as well. Lambert's research is a series of prehistoric murder investigations, minute reconstructions of traumatic wounds inflicted sometimes thousands of years ago. Head wounds are commonplace when people fight, but their severity depends on the weapons used and where the blows fall. Men who settled disputes with clubs or axes, for example, often display round or elliptical depressions, which are quite easy to identify, on the outer surfaces of their skulls. Injuries from this type of conflict are rarely fatal, but any head wound that penetrates the skull is very dangerous and often lethal. Such trauma is hard to identify, for bone does not recover if death occurs, and the fracture sustained in battle is sometimes difficult to distinguish from other damage. Walker and Lambert have studied nonlethal head wounds on Chumash  skulls. They found such wounds were more common among late prehistoric offshore island populations than on the mainland. Perhaps, they argue, this is because there was more competition for food and territory on such small, isolated landmasses. Disputes, especially those within a particular village, were sometimes resolved by nonlethal force, as is often the case even among the famous Yanomamo Indians of the Venezuelan rain forest, who are notorious for settling disputes by fighting with axes and clubs. However, competition must have been more widespread earlier in time, between about 1500 B.c. and A.D. 1150, because this is when Lambert has found head injuries to be most common, both on the islands and on the mainland coast. The decline in the frequency of such injuries after A.D. 1150 may be related to improving climatic conditions, which would have lessened competition for food resources. At the same time, hereditary chiefs became prominent in Chumash society, exercising greater control over the people. This also may have been a factor. Lambert has focused her research on projectile injuries, which she describes as the "smoking gun," clear evidence of violent conflict. Such injuries come from arrows, darts, and spears. None of these are very accurate battle weapons, especially at a distance, so one might expect a high incidence of nonlethal wounds, cases where people would walk around for years with pieces of stone point embedded in their flesh. Lambert has identified many individuals whose bones display healing around such a wound. In contrast, those killed at close range or killed by an arrow hitting a vital spot display wounds with no healing whatsoever. Lambert can even identify some wounds where the point was removed, either before or after death. One skeleton had a mysterious nick in a neck vertebra. Suspecting it was a projectile wound, Lambert checked the excavation records from 1928 and discovered a stone point had occupied the nick when the skeleton was dug up. Like archeologists, biological anthropologists often turn to arcane sources for vital information. Lambert turned up studies of casualties during the nineteenth-century Indian wars. In 1862, physician J. H. Bills observed the most common lethal arrow wounds were those to the soft tissue of the chest and abdominal cavity. Unfortunately, no traces of such wounds survive on prehistoric skeletons, because the soft tissue has perished. Again, Lambert turned to excavation records. One adult male from a cemetery near Point Mugu at the eastern end of the Santa Barbara Channel lay with a fragmentary projectile point in the region  of his abdominal cavity. Archeologist Phil Orr found one individual at the Mescalitan Island site near Santa Barbara with no less than seventeen points within his body, most in soft-tissue areas. When Lambert tabulated her projectile-wound data, she found there were some signs of violence, perhaps of war, as early as 3500 B.C. But such activity was relatively rare until about 1400 B.C. The incidence of projectile wounds reached a peak between A.D. 300 and 1150, dropping somewhat about 400 years before Cabrillo sailed into the channel. She believes this sudden peak was no coincidence, for three reasons. First, the bow and arrow first appeared along the California coast in about A.D. 500, at a time when Chumash warfare increased. This was the primary weapon of war when Europeans arrived, for it gave strategic advantages in range and accuracy, especially when used by groups of warriors. Perhaps the bow triggered major changes in the way people interacted with one another, just as the musket did centuries later. In any event, the shift from spears to arrows is very apparent in victims who died after A.D. 500. Second, Chumash society changed significantly in the centuries after A.D. 500. People congregated in much larger villages, living under the rule of hereditary chiefs who quarreled and competed constantly with one another. Third, deep-sea cores and tree rings from the Santa Barbara Channel region provide a telling story of a series of severe droughts and seawater warming during these same centuries, just when local populations were increasing rapidly. During these centuries, Chumash skeletons from both the mainland and the offshore islands display signs of deteriorating health and dietary stress. 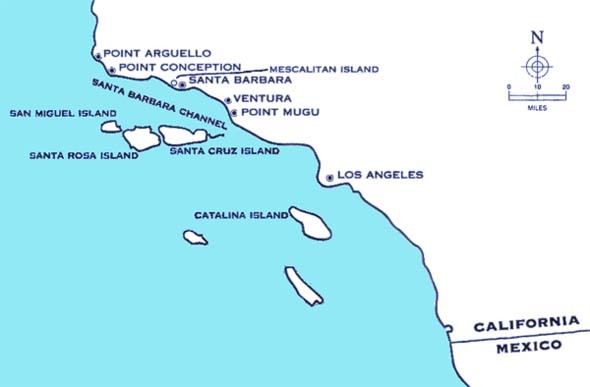 Chumash cemeteries at Mescalitan Island dating to between A.D. 700 and 1150 contained more projectile-wound victims than any other site in the entire Santa Barbara Channel region. Mescalitan lay in an easily defended location in the midst of a coastal slough, where fish and wildlife were abundant, and was occupied continuously for many centuries, right up to Spanish mission times. Even then, Chumash groups in the area fought one another. In 1775, a Spanish party encountered "some Indians . . . returning from these towns to their own villages. They had been fighting and were carrying one or more scalps . . . One of their number had been wounded:"
Sporadic violence, then, was part of Chumash life for many centuries. Warfare was connected, at least in part, with occasional food shortages and rivalry between different groups. These were not wars of  conquest or, for the most part, battles to repel invaders. They were a pattern of local conflict inevitable among people living in an area of unpredictable rainfall, highly localized food supplies, and intense social and political competition. Lambert compared the patterns of violence among prehistoric Chumash suffering from projectile wounds with those for the presentday United States as reported in FBI statistics. She found they were remarkably similar: 74 percent of the prehistoric victims were male, 79 percent of modern victims are male. In both samples, men were, or are, most likely to die between ages twenty and twenty-nine, while women were at highest risk between twenty and forty. Lambert believes there was a correlation between times of economic hardship and levels of homicide in prehistoric Chumash society, with incidents of violence reaching their peak in times of drought. Interestingly, the highest homicide rates in the modern United States occur in periods of economic recession, like the Great Depression of the 1930s and the downturns of the late 1980s and early 1990s. They are also to be found in poor urban areas, where unemployment is high and opportunities are minimal. In times of stress, people take risks, use violence to achieve their goals in ways they would not contemplate when life is more secure. Science tells us the Chumash, for all the apparent bounty of their coastal environment, were in some ways no different from modern Americans. From Brian Fagan.Time Detectives. New York: Simon & Schuster, 1995. 75-92.